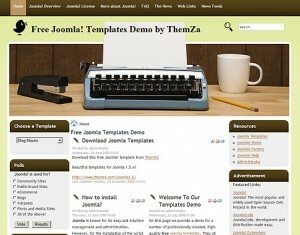 It’s time for blogging with the new free Joomla template by ThemZa. Nice, clean and retro-looking, the Blog Master is here to infuse your blog site with elegance of design and a truly romantic feel. This entry was posted on Friday, May 13th, 2011 at 9:39 am	and is filed under Joomla 1.5.x. You can follow any responses to this entry through the RSS 2.0 feed. You can leave a response, or trackback from your own site.